THE REVOLUTIONARY STORM SERIES RETURNS! The latest instalment of the NARUTO SHIPPUDEN: Ultimate Ninja STORM series will offer players a new experience in the deep & rich NARUTO environment. 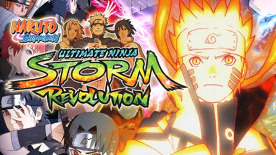 Tons of new techniques, enhanced mechanics, over 100 playable characters & Support Ninjas, and a brand new exclusive character (Mecha-Naruto) designed by Masashi Kishimoto. Ninja Battle Action - Amazing fights and original animation heighten the incredible action and interactive experience of the STORM series like never before. Improved Gameplay - New Gameplay mechanics with the powerful Combo Ultimate Jutsu and combined attacks. Never-before-seen Roster –100 Playable & Support Ninjas, including new characters and variations appearing for the first time! Exclusive Character - A brand new character (Mecha-Naruto) designed by Masashi Kishimoto exclusively for the game. Ninja World Tournament - A fresh and thrilling single player mode where 4 different Ninjas brawl and the one gathering the most Battle orbs wins! The Akatsuki origins revealed! - For the first time ever, the untold story behind the infamous gang will be told through an animation woven into gameplay! Game © 2014 BANDAI NAMCO Games Inc.